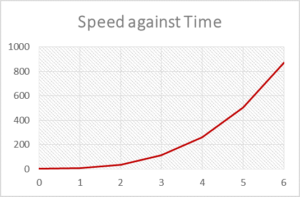 To be able to describe the motion of a body in mathematical terms, we must first understand the type of motion it is undergoing. The equation(s) of motion to be used will vary depending on the situation under consideration. 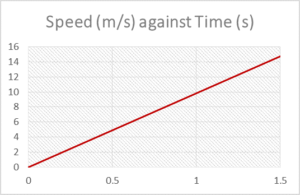 There are three general cases of linear motion characterised by the type of acceleration it is undergoing. A person takes 10 minutes to walk from point A to point B. 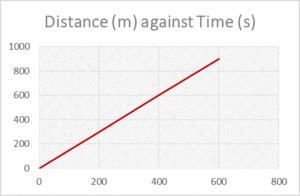 Calculate the distance separating the two points, assuming that he walks at a constant speed of 1.5 m/s the whole time. 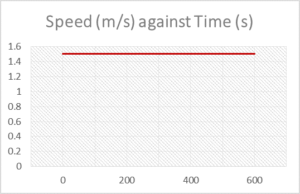 Answer: First, the time taken needs to be converted to seconds to remain consistent with units. 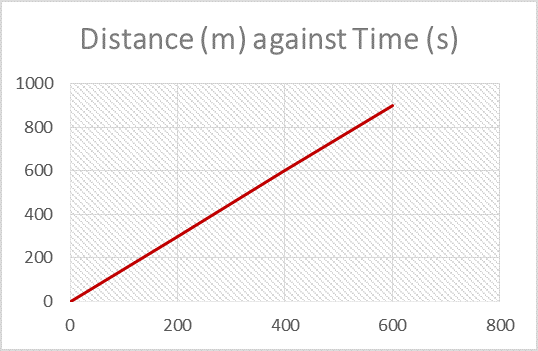 By plugging in the values into the equation, we then get a distance of 900 m.
In this case, the body accelerates at a constant rate throughout its motion. The speed it travels will therefore change as time advances. 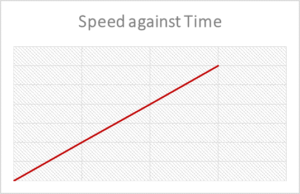 Typical graphs for this type of motion are as shown below. An object is held at rest 12 m above the ground. 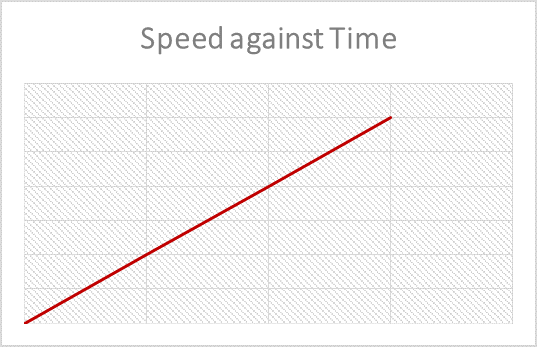 The object is released at time \(t=0 s\) and falls freely under gravity. 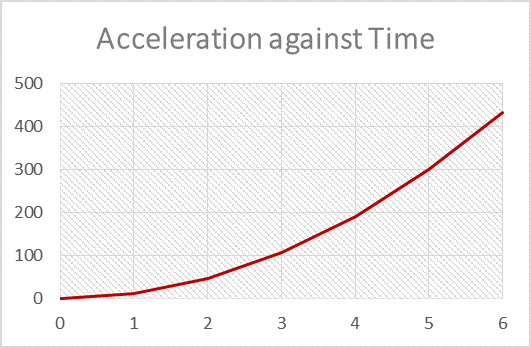 Given that the acceleration due to gravity is 9.81 \(m/s^2\), find its speed midway between its starting point and the ground. 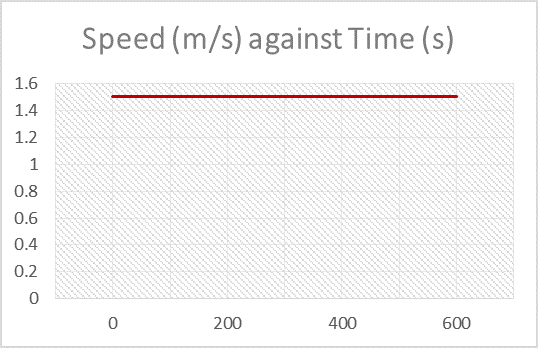 Answer: Using the third formula of motion (\(v^2=u^2+2as\)) and the quantities \(a=9.81 m/s^2 \), \(s=6m\), \(u=0 m/s\); we then get an answer of 10.85 m/s. 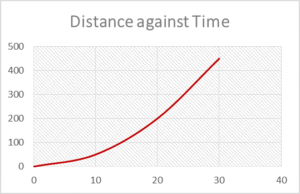 A particle moves in space with its speed given by the equation \(v= 4t^3 + 6\). 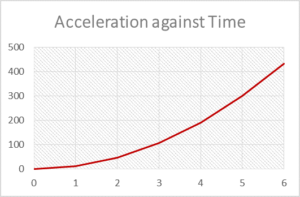 Find its speed, distance travelled and acceleration at time t = 5 s.
Answer: The speed can be found easily by plugging t = 5 s in the above equation, giving \(v=506 m/s\). 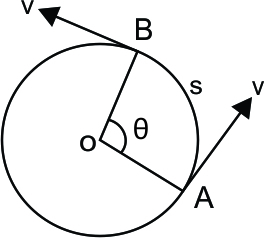 The acceleration can also be found by differentiating \(v\) and using t = 5 s. To find the distance travelled, we need to integrate \(v\) using limits of t = 0s and t = 5 s.
Consider a body that is moving in circular motion about point O as shown below. 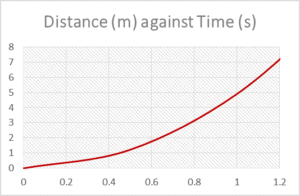 The motion of a projectile thrown at an angle \(x\) degrees relative to the ground is shown below. 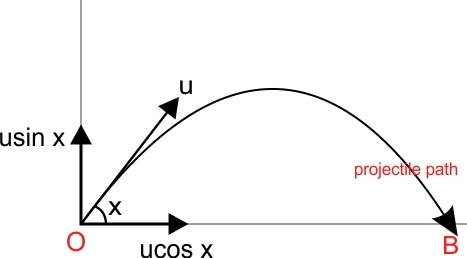 The velocity vector \(u\) can be decomposed to its 2 components \(u_x\) and \(u_y\). 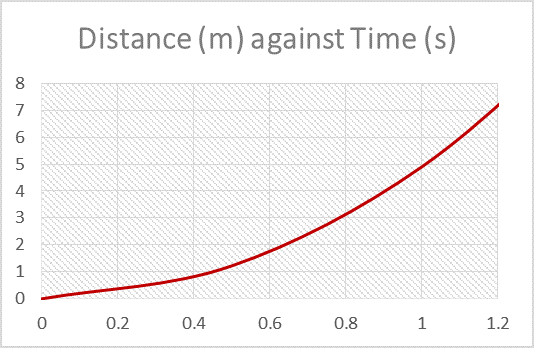 As soon as a projectile is released, its trajectory will depend on two things: its initial velocity and the acceleration due to gravity.